Stefano Rome Tours created an exclusive tour that where our guests will explore one of Italy’s few remaining undiscovered regions that ancient Roman Emperors and early Popes favored as their personal retreat from Rome’s chaotic life. You too can leave Rome’s chaotic, crowded tourist attractions and throngs of tour buses behind for a day and venture off into a different world altogether untouched by tourism where time-honored traditions have endured along with the ancient foundations that define the towns of Anagni, Fumone and Alatri that are the jewels of the Ciociaria region in the beautiful countryside of Lazio. Your Stefano Rome Tours English speaking Driver will pick you up at your Rome hotel or accommodation at 8 AM in a comfortable climate controlled deluxe vehicle for an enjoyable journey. You will be dropped off at the end of the tour at approximately 5 PM. 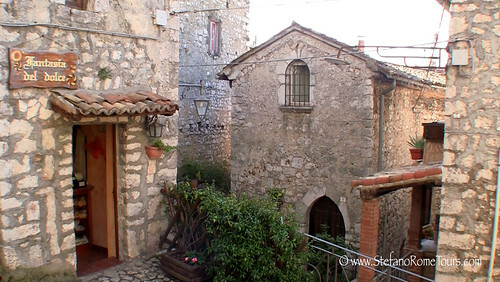 (Cick here to see more photos of Anagni). Astonishing legends, remarkable rich history, incredible medieval architecture and deep rooted traditions accompany the fame of Anagni, Fumone and Alatri, three distinct ancient towns in the heart of unspoiled territory of Ciociaria, in the region of Lazio, south of Rome. You will visit the town where ancient Roman Emperors spent their summer retreats and Popes were born, have a traditional lunch at a medieval taverna, see a notoriously haunted castle with shocking secrets, and walk through a 2,500 year old acropolis whose walls were constructed with boulders so large the populace believed they were built by mythological giant Cyclops. To say Anagni is an ancient town is an understatement; the earliest occupants settled here more than 700,000 years ago. More recently, during Imperial Rome, Anagni was the summer retreat for Marcus Aurelius, Septimius Severus, Commodus and Caracalla. As you admire the breathtaking verdant panorama that surrounds Anagni and breathe in the fresh air, you will see why during the 10th and 11th centuries popes deemed this region a healthier place to live than Rome. 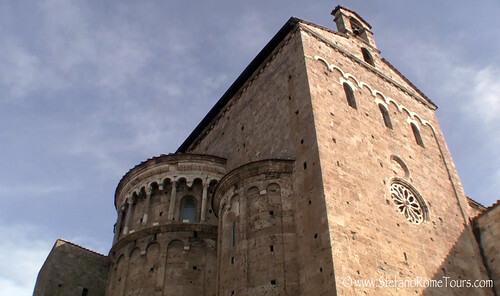 Nicknamed “The City of Popes”, Anagni produced 4 popes who were all members of the powerful Conti family. In this tour you will learn about the infamous last of the Anagni popes, Pope Boniface VIII, and why he tragically met his demise at the hands of King Philip of France, the dramatic event that marked the end of Anagni’s importance and moved the Papal seat from Rome to Avignon in France. Aside from extensive and astonishing history, Anagni is a remarkably charming town that naturally invites you to stroll through its narrow medieval streets lined with artisan shops, boutiques and galleries....and soon reach the architecturally impressive Romanesque style cathedral dedicated to Santa Maria. It was constructed in early 11th century over what used to be an early pagan temple that is said to have been converted into a church in mid 5th century AD. What lies beneath the cathedral is a crypt with stunning and vibrant frescoes created by monks that cover all of the walls and ceiling. Inside the crypt are the tombs of St Magno (patron saint of Anagni), and St Secondina of Anagni. Although often closed to the public for preservation purposes, when it does open it's a lovely surprise! After Anagni you will continue your drive through Ciociaria countryside to our next destination: Fumone. Rising to more than 2,500 feet above sea level and characterized by it’s unique conical shape and crowned with an impenetrable fortress is the Olympus of Ciociaria: Fumone. Fumone’s history is ancient, but we know that in 500 BC Tarquinio Superbus, the last king of Rome, retreated here after he was ousted by the Romans and planned his military vengeance. Fumone’s evocative name, “Big Smoke”, came about from an important function it held a milennia later. After the fall of the Roman empire, Fumone became a strategic point due to its geographical advantage, making it possible to keep vigilance against barbarians by alerting towns as far way as Rome of on-coming invasions by means of smoke signals. The popular saying of that time was: “Quando Fumone fuma, tutta campagna trema” - “When Fumone smokes, the countryside tremors”. After we walk through Porta Roma, the Roman gate, and enter the medieval hamlet inside the fortress, you will stop at the medieval La Taverna del Barone for an authentic Ciociaria feast for all the hungry knights and ladies. There are no menus here: you sit down, and you will be served the full course meal with all the specialties of the day prepared fresh from what is locally grown and in season. The aromas of steaming stews and mouthwatering roasts permeate the air and homemade local wine is served at the table. Don’t be surprised if your waitress will wear the traditional Ciociaria garments along with “cioce”, the ethnic peasant slippers with leather straps that lend their name to the region. After lunch, a stroll through quiet winding cobblestone streets will take you to the famous Castle of Fumone, formally known as the Longhi Castle as per its owners since 1586 when Pope Sixtus V transferred the castle to the Longhi family. Here is where tales of mystery, intrigue, creed and malice echo through the castle’s chambers and corridors. In the 12th century the Fumone castle was turned into a prison, and its most famous prisoner was Pope Celestine V, who after abdicating his papal throne was imprisoned inside a small solitary cell by his successor and nemesis, Pope Boniface VIII, who feared that Celestine may be reinstated if he changed his mind. The elderly pope died here a prisoner. Inside the castle’s noble chambers you will also discover a tragic event that took place in the Longhi family after they received possession of the Castle. After many daughters, the marquis and his wife finally had a son who would inherit everything according to the inheritance laws of that era. The older sisters who stood to lose financially, are said to have eliminated their infant brother by poisoning him. His small embalmed body is still in the castle inside a glass cabinet. It is said that the ghost of the grieving mother still roams the castle at midnight. Another legend speaks of the ghost of Gregory VII, known as the anti-pope, who was buried inside the castle though his body was never recovered, but his restless spirit still echoes throughout the castle. Are these tales legends or fascinating history? We might never know if they are stories created over time to add mystery to the castle or something unnatural really does wander the halls of this imposing medieval castle....the choice is yours, your imagination holds no boundaries or limits. The castle holds wonderful surprises as well! As you walk through the noble chambers and climb a spiral stairway to the top of the castle you will be greeted by a splendid rooftop terrace garden, and at 800 meters above the sea level you’re treated to a bird’s eye panoramic view of Ciociaria’s rustic countryside with green fertile valleys and distant forested hills. Because of its altitude, it’s considered the highest elevated hanging garden in Europe! 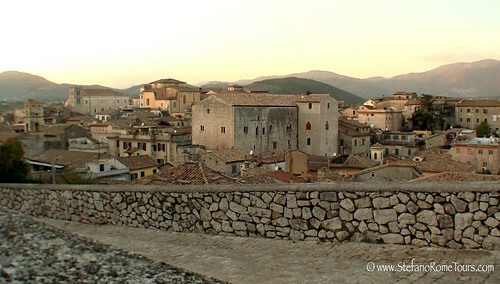 After Fumone we will head to the ancient Acropolis in the nearby medieval hilltop town of Alatri whose citadel walls were built with enormous polygonal boulders. The thick 15 meter high walls are also referred to as cyclopean because it was believed they were built by Cyclops: mythological one eyed giants capable of lifting such huge boulders. What is highly impressive about these 5th century BC walls is the precision used to arrange the large irregular blocks, so smooth and perfectly fitted together without any mortar that’s impossible to insert even a thin blade between adjacent stones. The type of polygonal masonry used here is almost identical to the renown polygonal wall of the Greek Delphi sanctuary from circa 500 BC. Aside from being established as an ancient fortress and holy site, some sources suggest the distinctive geometric shape and orientation of the Acropolis along with its gates were planned according to astronomical measurements and alignments. The monumental walls support a large artificial terrace above from which you have another splendid panoramic view of the town below and its terracotta rooftops, verdant patchwork of valleys, and the forested Ernici mountains in the distance that in the past indicated the border between the Papal State and the Kingdom of Naples. This marks the end of the tour. From here your driver will take you on another relaxing drive back to your hotel in Rome. Thank you for choosing Stefano Rome Tours for your tours in Rome and beyond. We look forward to seeing you in Rome soon! * The listed price of Legends and Castles Tour includes a professional English speaking Driver with a private deluxe vehicle, Italy’s VAT tax, fuel cost, insurance, applicable toll and parking fees. * The listed price of Legends and Castles Tour does not include lunch, gratuities, or other client personal expenses. * The listed price listed for the tour is per vehicle, not per person. Our guests may split the cost of the tour among themselves. * There is a nominal ticket fee to visit Fumone Castle. * Please allow up to 24 hours for email correspondence and service confirmations. In order to comply with Italy's stringent laws, Drivers are not permitted to act as guides and tour guests to sightsee. * Payment for the tour will be made in Euro funds to your Driver at the end of your journey. If you choose to prepay via PayPal, please let us know. Cancellations must be made via email and confirmed by us so we have it on record. We do not accept cancellations by telephone, text message, or 3rd party. * High elevation hilltop towns tend to cooler in temperature than Rome. Please take that into consideration and bring appropriate attire such as extra sweaters or jackets.